Heat 1 tbsp ghee in a thick bottom pan and fry besan on medium flame with cashews, till besan loses its raw smell and emits a sweet aroma. (approx 7-10 min on medium flame till it is light golden yellow).Shift it to a plate n let it cool. In the same pan add sugar along with 1/4 cup of water and stir on medium flame. The sugar will pass through 4 stages We should be constantly stirring to avoid lumps. In the end it will again be crystal sugar…. if u have some lumps remove them and grind them. Remove to plate and let it cool. 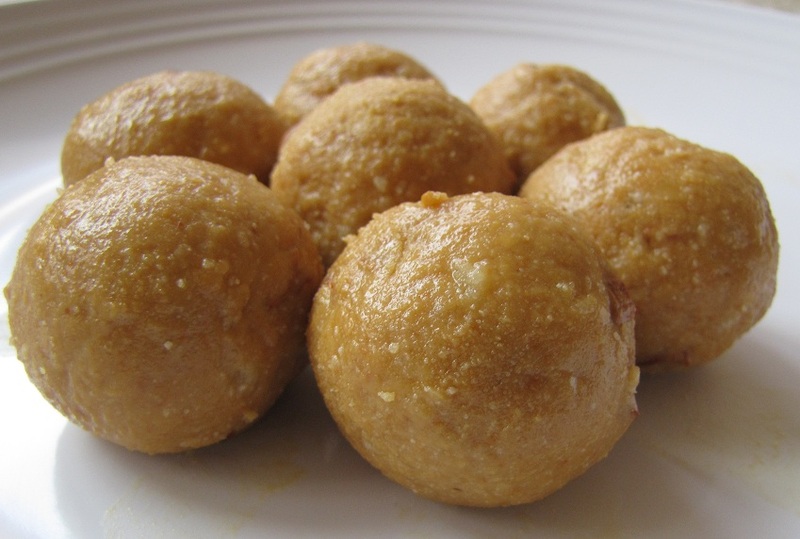 After it cools mix the fried besan,sugar,crushed cardamom seeds,almonds nicely.Divide the mixture into 3 portions and add and the required amount of ghee to one portion and shape it into 2-3 laddus.